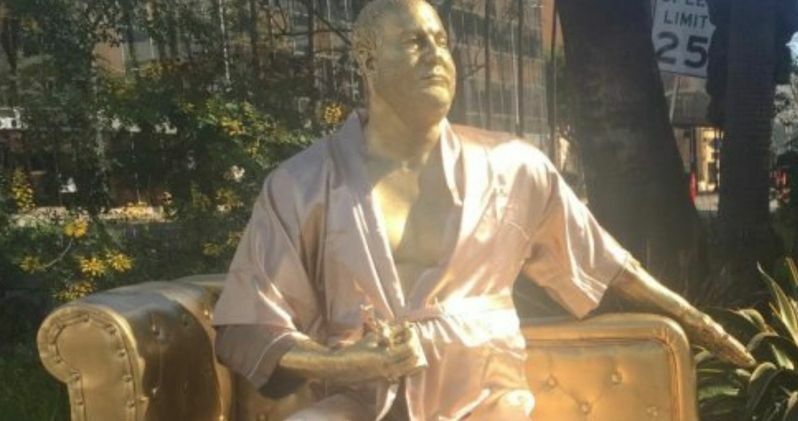 A unique gold statue of Harvey Weinstein has surfaced in Hollywood, just a few blocks from the Kodak Theater, where the The Academy Awards will be held this weekend. This comes just a day after an artist took over three billboards in Hollywood to protest the sheltering of pedophiles and sexual predators in the entertainment industry. Much like yesterday's piece of "protest art," this statue certainly doesn't celebrate Harvey Weinstein, but depicts one of the tactics he used as a sexual predator for decades. The casting couch statue, which surfaced today on the corner of Hollywood Boulevard and LaBrea Avenue, just a few blocks west of the Oscars Kodak Theater, depicts a golden Harvey Weinstein, wearing a partially-open robe and sitting on a golden chaise lounge. While one hand is clenching an Oscar statue, strategically near his crotch area, the other is stretched over the back of the chaise lounge, essentially inviting pedestrians and passers-by to sit next to him. The bottom of the statue features a gold plate that simply reads, Casting Couch. The statue was created by an artist known as Plastic Jesus, who is best known for his annual Oscars installations that explore the dark side of the entertainment industry, and Joshua "Ginger" Moore, best known for creating the Naked Donald Trump statues. The life-sized structure took two months to produce, with a casting taken from a friend of the artist that was later molded to fit Harvey Weinstein's face. Here's what Plastic Jesus had to say in a statement to The Hollywood Reporter. "For many years the exploitation of many hopefuls and established names in the industry was brushed under the carpet with their complaints of harassment and sexual abuse being ignored or worse. Hopefully, now in the light of recent allegations against many leading figures in Hollywood the industry will clean up its act." While Plastic Jesus refuses to reveal his real name, he stated that he used to be a London-based photojournalist, who moved to Los Angeles several years ago to create "installation art" to tackle sociopolitical issues. He also collaborated with Ginger on last year's Kanye West crucifixion statue, and he also created a 2015 statue that featured the Oscar statue snorting cocaine. Ginger is a Las Vegas-based artist, whose Naked Donald Trump statues appeared in several major American cities in 2016. Here's what Ginger had to say about the statue, stating he wanted to help "remove" the power of men like Harvey Weinstein by poking fun at it. "The whole couch and the entire image it gives off was to me a visual representation of the practices and methods that are used in Hollywood with these big powerful people. They have money and power to give jobs and they use that for their own sexual gratification and there's no better way to visualize this than the way we did with the casting couch. Everyone wants a selfie, everyone wants to be part of the experience. To be able to knock the monster down a peg and poke fun and ridicule it helps remove its power. That's how you take these powerful people down. As Mark Twain once said, 'Against the assault of laughter, nothing can stand.'" With this statue surfacing just days before the Oscars telecast, it will be interesting to see if host Jimmy Kimmel, whose studio for Jimmy Kimmel Live is just across the street from the Kodak Theater, will incorporate the statue into any of his bits for his opening monologue or other sketches during the Oscar telecast. You can take a look at photos of this Harvey Weinstein statue below, courtesy of The Hollywood Reporter, and if you're in Los Angeles, you can find the statue yourself on the corner of Hollywood Boulevard and LaBrea Avenue.